Stunning fresh Red Basket makes any day an unforgettable event! 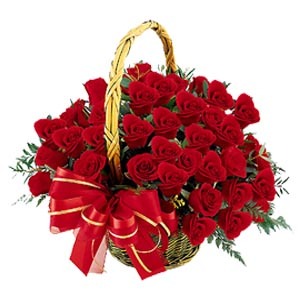 Send 50 Classic Red Roses perfectly arranged in a basket with greenery and fillers. Convey the warm feelings of your heart with our Happy Days Bouquet. The Happy Days Bouquet features 50 beautiful blooming red roses creatively arranged by our expert florist. This is a perfect anniversary gift priceless yet affordable. Send flowers to express your love, revive your vows with this stunning bouquet. 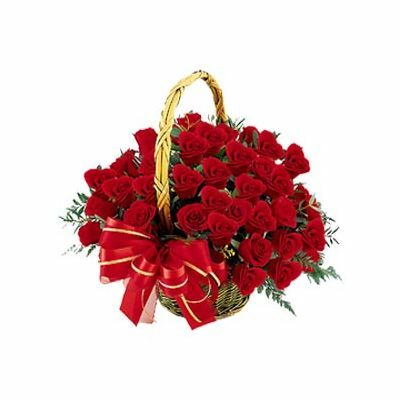 You can also send this enchanting rose bouquet on Valentine’s Day. To add a personal touch, we can make home delivery even at midnight. You can send flowers online too. Our fresh sweet smelling flowers are bound to win the heart of the one you love and make your special occasion memorable. Consider for: Birthday, Wedding Day, Anniversary, Baby Showers, Retirement, Mother's day, Father’s Day, Gifts For Boss, Gifts For Him, Gift For Her, Valentine's day. We Offer Home Delivery Service for flowers including same day delivery and midnight delivery. Home Delivery | Send Flowers | Flower Bouquets | Florist | Same Day Delivery | Midnight Delivery.